We’re now on Day 9 of our tour. As the most coveted piece of real estate in the world, the Temple Mount has a pretty long and interesting history. More wars have been fought over Jerusalem (and the Temple Mount) than any other piece of property in the world, bar none! Around 2,000 BC, Abraham took his son Isaac up to Mount Moriah to offer him as a sacrifice. Read Genesis 22. It is generally believed that Mt. Moriah is exactly where the Temple Mount is located. Muslims believe that Ishmael (their great-great grandfather) is the lad in the story and not Isaac (the great-great grandfather of the Jews). If you ask me, Moses wrote the story in Genesis 600 years after it happened. Why Mohammed would have better details than Moses when Mohammed was almost 2,600 years after Abraham is beyond me. But I digress. Oh, and remember that King Melchizedek fellow, the ‘king of the Most High God’ that Abraham blessed in Gen 14? Remember how he was the King of Salem? Salem .. JeruSalem… hmmmmm. Around 1,000 BC, King David conquered the Jebusites’ capital of Jerusalem and set up the City of David. He wants to build a temple for God, but God tells him his son Solomon will build it instead. David returns the Ark of the Covenant to Jerusalem and places it at the tabernacle (2 Sam 6). 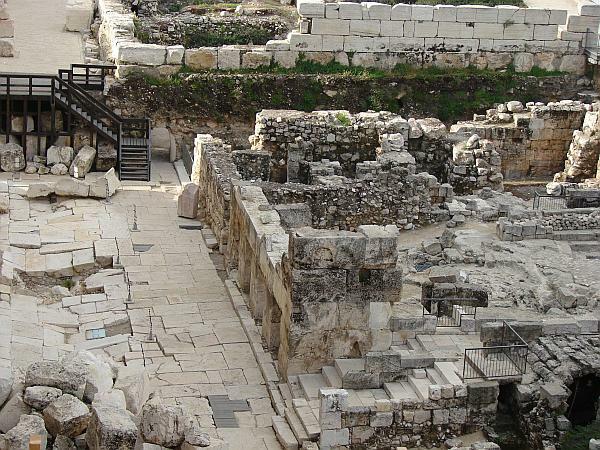 Solomon, with the help of Hiram of Tyre and 183,000 workers, begins construction of the temple on Mt. Moriah in 966 BC (1 Kings 6). For the next ~1,000 years, every year, a passover lamb is slain at the temple on this mountain. Around 835 BC, Joash repairs temple, establishes maintenance fund, and brings period of revival and reforms to southern kingdom of Judah. (2 Kings 12:5ff). Around 640 BC, Josiah repairs the Temple and brings about national religious reforms. (2 Chronicles 34-35). In 541 BC, despite fierce opposition and delays, Zerubbabel, Ezra and Nehemiah, by order of Cyrus, King of Persia, begin reconstruction on the city, temple and wall, beginning with erection of an altar of sacrifice on Mt. Moriah. Temple completed after 15-year delay in 516. Note: this is exactly 70 years after its destruction under Nebuchadnezzar – exactly as prophesied by Jeremiah. Israel remains under Persian control. In 175 BC, after Alexander the Great conquered the known world, one of his successors, Antiochus Epiphanes, desecrates the temple by sacrificing a pig on the altar and carrying off temple treasuries. Worship and sacrifices halted, 15 December 167 BC. Because of Antiochus’ desecration (prophesied by Daniel), the Jews are led to revolt by the leadership of the Maccabees. They overthrow their Greek oppressors. The temple is purified and worship and sacrifices restored in 165 BC. This starts the celebration of Hanukah, and for a few brief years, Israel is under their own leadership of kings. In 63 BC, Rome conquers the Holy Land. Pompey brazenly enters the Holy of Holies, disappointed to find it empty. In 42 BC, Herod the Great was appointed tetrarch (king) of Judea. He’s a cruel and despotic ruler, an Idumean (descendant of Esau). Although he considered himself a Jew, the Jews did not accept him as a legit Jewish king – and certainly not of the messianic line of David. He killed anyone who posed a threat to his rule, including his two oldest sons. He’s the one responsible for the murder of the infants in Bethlehem. He builds vast projects in Jericho, Hebron and Caesarea. In order to appease the Jews, he orders the now-500 year old temple to be rebuilt and expanded considerably. The 50-year project required 10,000 workers, 100 priests, 1000 wagons. Many Jews would have nothing to do with Herod’s version of the temple. They left Jerusalem, certain God would have nothing to do with Herod, the city or Herod’s Temple. Jesus, however, called it His Father’s house. Food for thought. ~30 AD, Jesus tempted by the devil on the pinnacle of the temple, (Luke 4:1-12). Jesus casts out money changers from the temple early in His ministry (John 2:13-16), and again three years later. During His final week of life before His death and resurrection, He taught in the temple courts and confronted the crowds and Pharisees there. Jesus predicts destruction of the Second Temple. (Matthew 21ff, Mark 11, Luke 19, John 12). During Passover week, approximately 30 AD, almost 2,000 years after Isaac was sacrificed on this mount; almost 1,000 years after Solomon built the temple on this mount – the Lamb of God began His trial under Pilate in the praetorium, located immediately north of the Temple Mount. He would be put to death just a few hours after the passover lamb was ritually killed and eaten by Jews all over Israel. In 70 AD, according to Josephus, the Roman army, under the direction of General Titus, began to destroy Jerusalem. His soldiers tear apart the temple and haul off treasures to Rome. 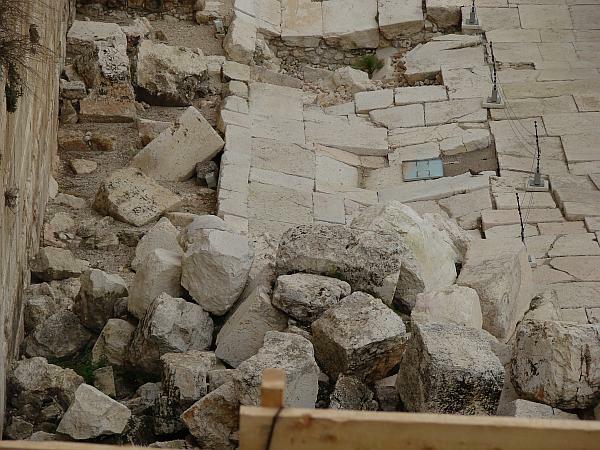 True to Jesus’ prophecy in Luke 24, they throw all the stones of the temple complex down off the temple mount. In 136 AD, the attempt to build the third temple fails. In 362 AD, Julian authorizes the Jews to build the third temple. The location had been neglected and was now a refuse heap. His work, however, is stopped by fire and earthquake. According to Islamic tradition, Caliph Omar clears rubbish from Temple Mount and prays there in 638 AD. Old wooden El Aksa Mosque constructed, 700 AD, and Dome of the Rock by Abd el-Malik, 684-690 AD. 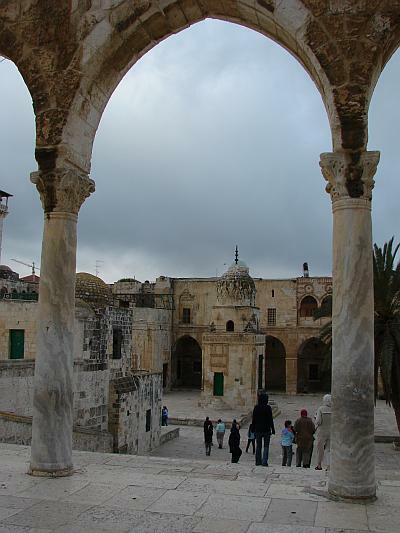 An earthquake in 746 AD destroys the El Aksa Mosque. Suleiman the Magnificent conquers Jerusalem in 1831. He builds walls and improves the city and aqueducts. Jews are tolerated, but heavily taxed and their property confiscated. Today, the Temple Mount is open for visitors. It is owned by the Jews, but controlled by Palestinians. The Temple Mount, located in the heart of Old Jerusalem, is 1500 feet long (north to south) and about 1000 feet wide. It featured a number of patios, porches, and buildings – and as Jesus prophesied in Matt 24, all of it was destroyed and ‘cast down’. The only thing that still stands today is the foundation wall around the Temple Mount. The wall is, in some places, as high as 75 feet above the ground. 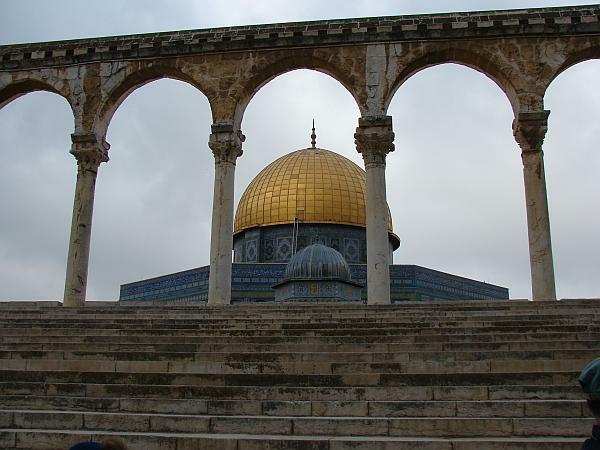 Everything else on the Temple Mount was built by the Muslims (650 AD to 700 AD) or Crusaders (1100 AD). On the west side of the wall is a section called the Western Wall (formerly called the Wailing Wall). Immediately south of the Wailing Wall is a curved ramp leading up to the Mugrabi Gate. As you enter Mugrabi gate, you can look down and to your left and see worshippers praying at the Wailing Wall. If you look down and to your right, you’ll see a few of the stones thrown down by the Romans as they destroyed the temple in 70 AD. 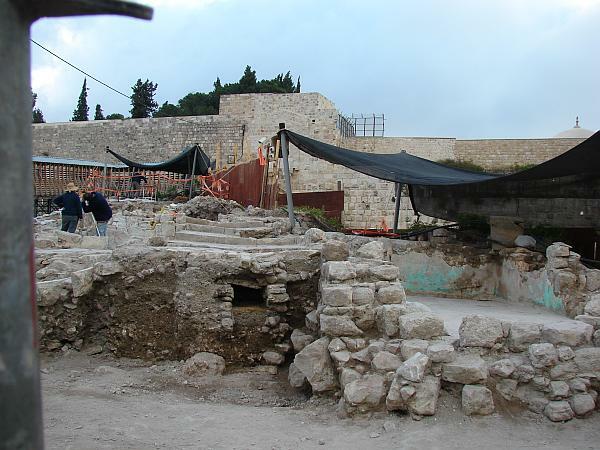 On the south side of the Temple Mount is a set of excavations. The steps leading up to the Beautiful Gate are located here as well. On the east side of the Temple Mount is the Gate of Mercy, or the Golden Gate. As prophesied, it is closed. Sealed up till the return of the Messiah. 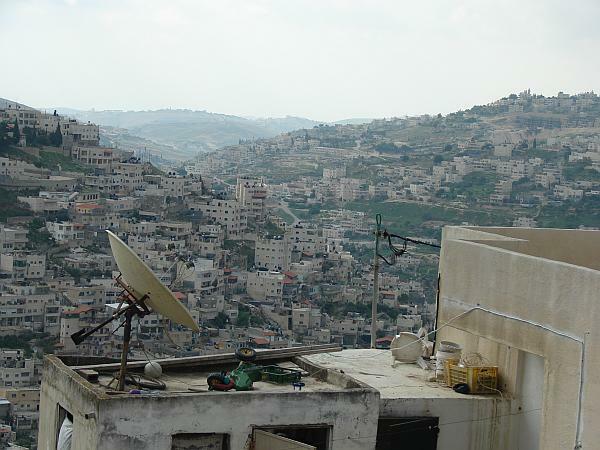 It overlooks the Kidron Valley and the Mount of Olives. This is where Jesus prayed in the garden of Gethsemane. On the north is the Fortress of Antonia. Pilate stayed here. This is where Jesus was tried by Pilate. In order to talk about the Temple Mount and its significance, it’s first important to understand exactly what the Temple Mount is. Well.. it’s a mountain. Mount Moriah, to be specific. And on that mountain, Herod significantly expanded the temple that Zerubbabel built in 516 BC in order to make the Temple that Jesus walked around in. It is a holy site for the three major world religions: Judiasm, Christianity and Islam. Here’s a view of the Wailing Wall. It’s called this because for many years, this was the closest that Jews were allowed to come to the site of their Holy Temple. And they were only allowed to come once a year. On the far right side of this photo is the ramp that leads up to the Mugrabi gate. Orthodox Jews are prohibited from going up on the Temple Mount because they don’t know exactly where the Temple stood. Heaven forbid if a Jew were to stand in the spot where the Holy of Holies stood – he might be struck dead by God. On the south side of the ramp is an archaeological dig. I’m not sure what all they’re finding there, but as you get close to the Temple Mount, things get interesting. Right before entering the Mugrabi gate, you can look to your left and see people praying at the Wailing Wall. Light crowd. We were there early. By the way, the ‘floor’ that everyone is standing on there is actually the top of the debris of the temple remains that were thrown down by the Romans in 70 AD. 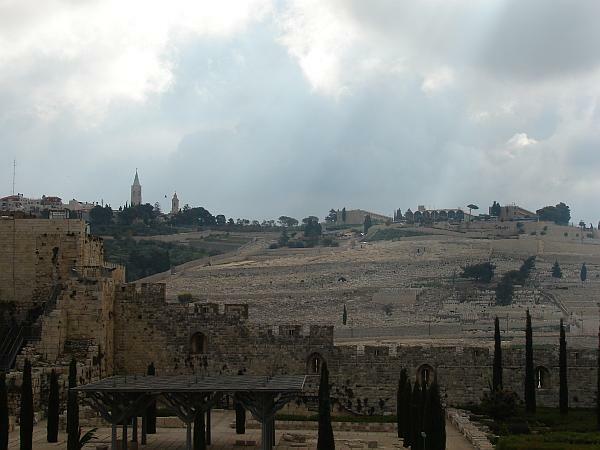 The arches to the north (visible at the top of the photo) actually stood about 50′ above the ground in Jesus’ day. If you look to the right, you’re looking to the south.That’s the Hinnom Valley in the background. Bethlehem is off in that direction somewhere. Pay attention to the old Roman road that’s left-of-center in this photo. This photo is from the top of the ramp, looking southward. The Temple Mount is just on the left, outside of the view of this photo. The streets below are the original Roman streets from Herod’s day (aka, the time of Christ). What you see on the Roman road is pieces from the temple complex that have been thrown down to the road below with such a force that it broke the road. The largest of these stones is about 5′ in length. This happened in 70AD with the destruction of the temple. Spooky! When Jesus talks, people better listen. 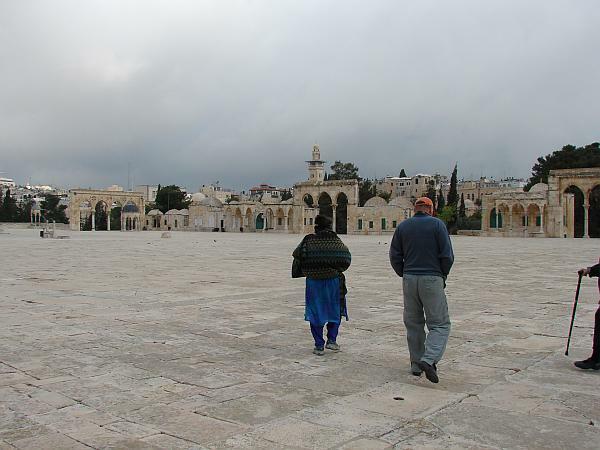 This courtyard is one of the first things you see when you get up on the Temple Mount. 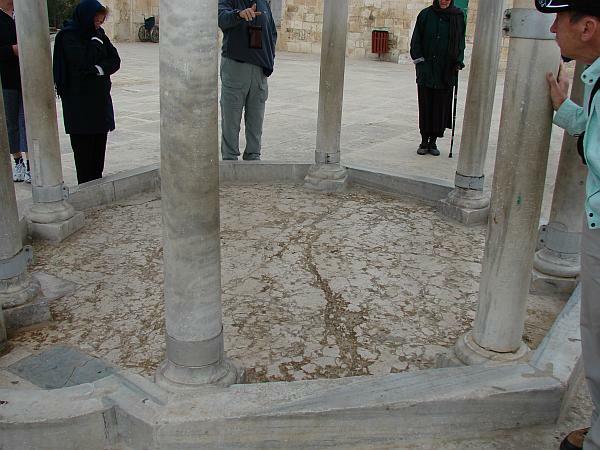 This fountain is in front of the Al Aqsa mosque, on its north side. Worshippers (men) would come here and wash before entering the mosque. On the east side of the Temple Mount is a nice park-like area. This particular road runs north/south, just east of the Dome of the Rock. A close-up of the tile work on the Dome of the Rock. The Dome of the Rock was built to commemorate the place where Mohammed supposedly touched down to the earth during his visit to heaven to discuss earthly matters with Jesus and God. It’s one of the only places where the actual rock of the Mount Moriah shows through. My old pastor went inside the building when he visited Israel. He says it gave him the willies and felt satanic. He had to get out. Heading to the gazebo where another part of Mount Moriah is exposed through the tile. Dr. Dave is on the right. The top of the dome is gold. It serves as a clarion call to all infidels to come and be converted to Islam. No thanks. It was built in 684 AD. Near the north-west corner of the mount is a gazebo where the original rock of Mount Moriah is exposed. The western portion of the Temple Mount. View of the Temple Mount from the south. The Beautiful Gate is in here somewhere, behind the trees. This would be where Peter and John healed the lame man. It wasn’t opened to the public. Mount of Olives, as seen from the Temple Mount. The Kidron Valley is out of sight, between the wall and the Mount of Olives. East side of the Kidron Valley. This would be where Bathsheeba probably lived.